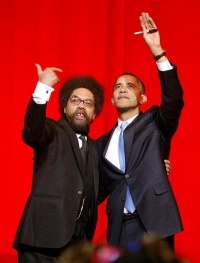 Cornel West is a leading U.S. Marxist academic and activist. He is an honorary chair of Democratic Socialists of America. His involvement in the DSA can be traced back to 1977 at which time he was a contributor to the newsletter of the Democratic Socialist Organizing Committee Religion and Socialism Committee. DSOC would later become the largest socialist organization in the U.S., the DSA. In 1983 he was at Union Theological Seminary. In the mid 1990s Cornel West was a contributing editor to Oakland based Institute for Social and Economic Studies - sponsor of CrossRoads magazine. Among the goals of the magazine was, seeking to "promote dialogue and build new alliances among progressives and leftists... and to bring diverse Marxist and socialist traditions to bear..." In 1994, West was listed as one of over 100 New Party activists credited with building the New Party. This was the same organization which in 1996 would put its weight behind candidate for the Illinois State Senate, Barack Obama. This page was last modified on 1 July 2010, at 20:31.